Squarehead™ FRN - Spyderco, Inc. Page 1082 – Spyderco, Inc. The Squarehead Lightweight faithfully maintains the innovative design concept and compact functionality of the original Squarehead, but in a more economical format. Its distinctive sheepfoot blade is crafted from American-made CTS® BD1 stainless steel and features a single-sided flat chisel grind to ensure the PlainEdge™ cutting edge nests safely in the handle. 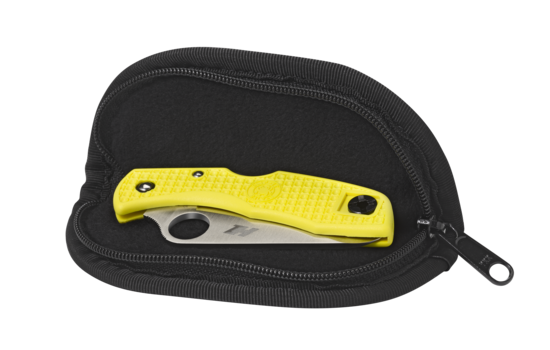 A generously sized Trademark Round Hole™ proudly announces the knife’s Spyderco pedigree and allows easy one or two-handed opening. The foundation of its handle construction is an injection-molded fiberglass-reinforced-nylon (FRN) scale. The outer surface of the single-sided scale has a Bi-Directional Texturing™ pattern to ensure a secure grip, while the inner surface houses a nested stainless steel liner that forms the core of the knife’s sturdy LinerLock mechanism. The base of the molded FRN scale features a wide slot that allows the knife to be easily attached to a keychain, neck chain, or lanyard.